The term futuristic refers to items that look advanced and ultra-modern, but in the airsoft world, it makes reference to badass-looking guns that implement a creative design. It’s that pistol or rifle that will catch everyone’s eyes the moment you get it out in the field. Most futuristic airsoft guns are inspired by the latest developments in the military, but there are also some inspired by video games. To be honest, I find the latter more attractive, because it’s easier to immerse yourself in the world of your favorite shooting game. Regardless, futuristic airsoft guns are more focused on delivering a unique look rather than an impressive performance. Of course, this doesn’t mean the gun won’t behave well on the field; it’s just a friendly reminder that futuristic doesn’t necessarily mean extremely advanced. If you’re looking for that special gun that will make other players remark you from afar, have a look at my top five futuristic airsoft weapons. The FAMAS rifle is a replica of the latest FAMAS F1 real steel rifle series and is a rather unique design that places it in between a sniper and a CQB rifle. This rifle delivers the long-range DMR experience while looking and feeling like a short barrel design and delivers high-accuracy at medium range. This is possible by placing the magazine behind the pistol grip (it’s a Bullpup design), and not in front, like with most M4s and AKs. Furthermore, it comes equipped with a built-in bipod, that allows you to aim at long distances. Also, the outer barrel has an adjustment lug for mock APAV-40 grenades and you can fit some mock bayonets to it (for extra emphasis). However, in my opinion, the design is unique enough to require any such accessories. I love the handguard that serves as a battery compartment (9.6v Nun-chuck and brick battery designs) and features a Picatinny rail for accessories. Moreover, the carry handle situated on the top is fantastic for installing your optics and sights but can also beused to install another Picatinny rail, for more accessories. There’s even an adjustable hop-up dial, under the ambidextrous cheek rest, and the rifle supports safe, semi, and fully automatic modes. The rifle is delivered with a 300-round high-capacity magazine that simply snaps into place. Overall, the rifle is accurate and powerful (385 FPS), supports a wide range of games and looks badass enough to make you the star of your team! While it’s not something a Stormtrooper might have used, the XR5 1503 comes with a unique and compact design that makes it look like an energy weapon. The good news is that, even though it looks different, it is compatible with many aftermarket parts from various brands, so you don’t have to worry about upgrades. From the box, you’ll get a bulky-looking rifle, with plenty of space for optics, due to the top, side and bottom rails, and foldable sights that can be removed. The stock is also adjustable, which makes the XR5 1503 great for various actions, starting with CQB and ending with mid-range shooting. On the inside, you’ll find a metallic Version 2 gearbox, an adjustable hop-up and a standard 14mm CCW barrel (363mm in length). Furthermore, the rifle is delivered with a drop-free 225-round magazine, shoots at about 390 FPS, and supports both semi and full-auto firing modes. Since it’s an AEG, it uses 9.6v 1600mAh NiMH Nunchuck batteries, that are housed in an easy-to-access compartment. Like many rifles considered futuristic, the JG AUG A3 is inspired by a real steel counterpart. JG drew their inspiration from the Steyr AUG, a rifle designed in the 1960s, and used by the Austrian law enforcement agencies. Around 1978, the rifle became the standard small arm for the Austrian Bundesheer and was later adopted by other armed forces at a global level. The airsoft version features polymer body and full-metal internals and puts a futuristic spin on the design using a RIS top rail and three Picatinny rails on the handguard. This opens the door for customization and upgrades, but only if you want this. The rifle is equipped with everything you need (flip-up sights, adjustable hop-up, and even an 8.4v 1200 NiMh battery) to get started in the field. Moreover, the AUG A3 features a Bullpup design, meaning that the magazine is placed behind the pistol grip, and not in front, as it happens with most standard designs. This allows for a longer barrel (510mm), increasing the accuracy and range. Also, the rifle is powerful (350 FPS) and lightweight, which makes it convenient in a wide array of airsoft situations. If you want a unique design, look no further! 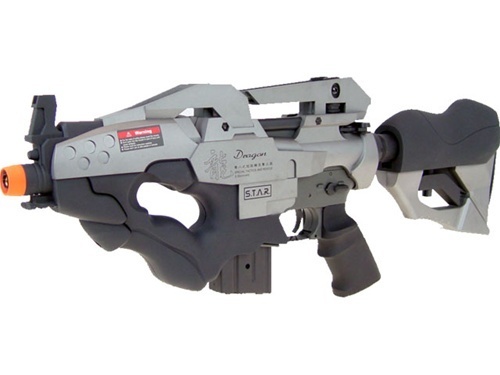 The STAR DRAGON from JG is a gorgeous-looking piece of weaponry built on an M4 platform with a Version 2 gearbox, which means it’s easy to replace pieces and upgrade it. Now, if you’re wondering, yes, the design is based on a video game and an anime! However, besides the sci-fi look, there’s nothing special about this weapon. The build is a combination of durable ABS plastic and metal (the gearbox, magazine, receiver extension, and charging handle), and it’s a bit on the heavy side. It has an adjustable flip-up sight and a fixed front one, it’s extremely comfortable to use, and features an adjustable stock. Overall, the rifle is compact, which makes it great for both open field and CQB, but it’s designed with right-hand users in mind. There is even a small Picatinny rail that can accommodate a flashlight or a laser. In terms of accuracy, the STAR DRAGON does a pretty good job, especially due to the adjustable hop-up system, and is quite powerful at about 380 FPS. Finally, it comes with a hi-cap magazine (170 rounds) and an 8.4v 1100mAh battery, which means you can use it right out of the box. 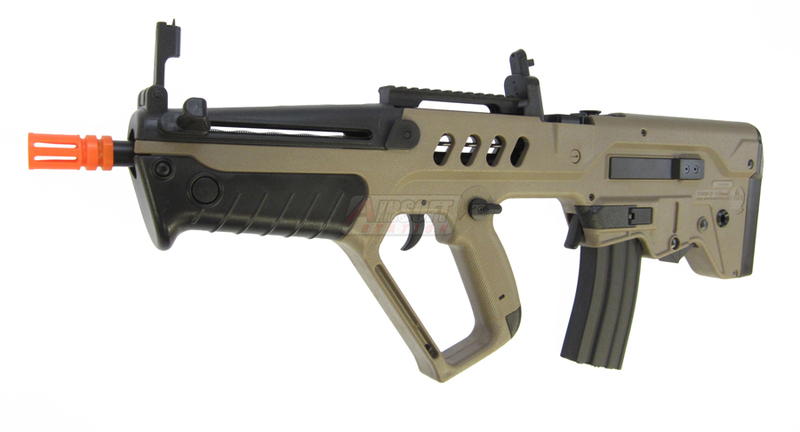 Designed after the well-known Israel Tavor, the TAR-21 Competition is an ABS rifle with Bullpup design that gives it the possibility to use a long inner barrel (509mm) in a CQB compact size. The rifle is compatible with all standard M4 magazines and it’s quite adaptable, so you won’t have any troubles upgrading it. There are flip-up sights and an adjustable hop-up system for increased accuracy (since the rifle can shoot at about 150 feet), but there’s also a top Picatinny rail to install optics if you feel the need. The internals feature a full metal gearbox with metal bushings, which support a muzzle velocity of 370 FPS. The gearbox is snappy, which means the rifle is loud. It also means that you’ll feel every shot in the rifle’s body, creating some sort of recoil effect. Moreover, the rifle is delivered with an 8.4v battery (housed in the handguard), but it can also use a 9.6v battery if you feel the need for extra power. There are other cool-looking airsoft guns out there, but it’s important to understand that they are mostly just for show. As with the examples above, the unique design is applied on a common platform. So, if you’re looking for something to get you out of the crowd, these are perfect. However, if you’re looking to invest in performance more than aspect, then maybe you should consider a DMR or an M4.